Following months of anxiety and uncertainty, the UNHCR has officially announced that ethnic Chin refugees shall not be subject to cessation of refugee protection in India and Malaysia owing to the need of continued international protection keeping in mind the conflict in Myanmar’s Southern Chin State. The United Nations High Commissioner for Refugees (UNHCR) announced recently that they would no longer be actively progressing cessation against Chin refugees in India and Malaysia. This means that Chin refugees in countries of India and Malaysia will no longer be required to return to Myanmar by December 31, 2019 as was previously determined. “We recognise that Chin refugees may still require international protection due to the worsening security situation in southern Chin State in Myanmar, which has resulted in new displacement”, said Volker Türk, Assistant High Commissioner (Protection) for UNHCR. Ravi Nair, Executive Director, South Asia Human Rights Documentation Centre pointed out that it is “unclear if the cessation is temporary or permanent”. “The decision of UNHCR to stop the cessation process for Chin refugees is welcome. It is essential that UNHCR restore all the refugee cards to refugees it had taken away. It must also provide public assurances that all the Chin refugees will be provided the protection that they are entitled to,” he told Delhi Post. Remmawi, President, Chin Refugees Committee (CRC) apprised Delhi Post that UNHCR in a meeting with the refugees has agreed to issue new refugee identity cards which will take “a little bit of time”. She also stated that notification interviews will also “stop now”. Earlier, Chins approaching UNHCR for renewing their refugee identity cards were to be provided individual counselling, and offered the option for a notification interview if they still felt in need of protection. The Asia Pacific Refugee Rights Network (APRRN), network of 350 civil society organisations and individuals from 28 countries working for rights of refugees in the Asia Pacific region, welcomed the move. 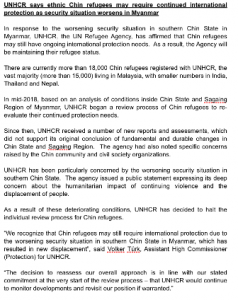 It stated that UNHCR has exercised “due diligence in monitoring and responding to the evolving and deteriorating conditions in Southern Chin State”. APRRN Secretary General, Themba Lewis, responded positively and stated that “cessation guidelines require a high threshold be reached in order to trigger the removal of international protection because the risks are very high”. Whilst protection resumes, “it is not a cause to outright celebration” as conditions still prohibit safe return for Chin refugees demonstrating persistent challenges. Chin State remains heavily militarised, and human rights abuses are well documented. With the conflict between the Arakan Army (AA) and Burmese military in Chin State ensuing, and with no permanent ceasefire agreement between Chin National Front (CNF) and Burmese Military, refugees, human rights activists and organisations state that “without disarmament and security sector reform, this ceasefire will remain tentative”.